I recently witnessed someone say they were going to start a new video show. In an introductory video, they were trying to build up momentum to the launch of the show. Commitment is a scary thing. Saying you’ll be somewhere or do something consistently is really sticking your neck out there. A lot of people are afraid to make a commitment to showing up. What if I’m not feeling motivated? The problem is, while we think this is protecting us from breaking a commitment, it’s actually preventing us from ever upholding one. It’s working against the very force that will enable us to show up every day. We all know “that friend” who only sometimes shows up to parties when you invite them. “Sure, I’ll be there!” they say, but you know there’s maybe a 20% chance they’ll actually come. Why is it that you know there’s only a small chance they’ll be there? Track record. They have a history of not keeping their commitments. It’s a scary thing to make a commitment to show up consistently. It takes real guts. I’ll let you in on a little secret: it’s hard for me every time I have to show up. Every single day, it’s a struggle. Here’s the reality: it’s not easy for anyone—even the people that make it look easy. In fact, if someone is making it look easy, they’re probably working all the harder. Why is it so hard to commit? The reason you don’t do something is because you psyche yourself out of doing it. Part of you wants to do this thing—part of you wants to commit and be consistent—but another part tries to tell you why you can’t do it. In order to eliminate that kind of sabotage, you have to remove the option of psyching yourself out. You have to find a way to get your back against the wall. There can’t be any choice in the matter. You have to remove that freedom of choice. It has to be something that you do. There’s no question that you’re going to eat, or go to the bathroom, or brush your teeth—those are all just things you do. Until something is just a “thing that you do” there will continue to be the option of not doing it. There has to be no question. You have to eliminate the paralysis of choice. We think that freedom is working for us, but it’s really working against us. Creativity is something that flourishes within constraints. If you have infinite time and possibilities, it’s actually more overwhelming than helpful and often results in nothing getting done. The more you tighten the constraints, the more your creativity will flourish. Constraints may come in the form of time, or tools, or even topics. If you have a whole day to get something done, you’ll probably spend the majority of it goofing off. But if you have 45 minutes, you no longer have the freedom of choice. There’s no question. You simply have to get the work done. 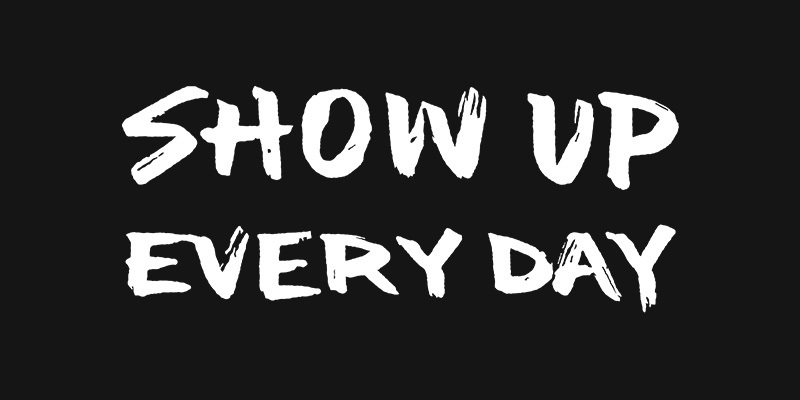 The people that show up every day do it because it’s a thing that they do. They’ve turned something that used to be a choice into a habit. They’ve incorporated it into their lifestyle. 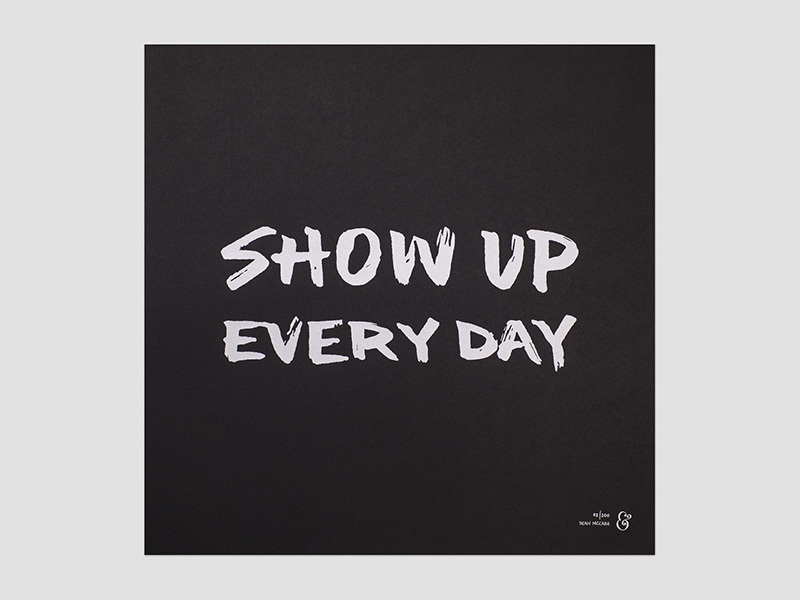 That doesn’t mean it’s always easy to show up, but it does mean there’s no question of whether they’re going to show up. A big part of being able to stick with a commitment is leveraging the power of accountability. I recommend you utilize all three because it forms a three-fold cord that is difficult to break. Partner accountability is arguably the strongest form of accountability. Making yourself accountable to someone is a great way of keeping yourself on track. It’s easy to let ourselves down, but we care a bit more about what other people think of us. If we tell ourselves we’ll wake up at 6:30am tomorrow, we may or may not hit the snooze a few times. But if we schedule an accountability call with a partner at 6:30am, there’s a bit more incentive to show up because we’d be disappointing another person if we didn’t. We don’t like being let down, so we’re less inclined to let other people down. We know that we’d be causing our buddy to wake up early and show up only to find out we left them hanging. No good friend does that. While Partner Accountability is very strong, pairing it with Public Accountability makes us take commitment even more seriously. In addition to committing to one other person, make a public commitment to do something. Let’s say you plan to blog every week. You’re going to meet with your accountability partner once a week and they’re going to check up on you and make sure you’re following through. This is good. However, also state publicly that you will be blogging every Friday. Make that commitment. Your partner is going to keep you on track, but secondarily, you now have made a public commitment to show up consistently and your reputation is on the line. If you don’t show up, not only do you let your partner down, but you mar your track record with a public audience. Your word now means less. You’re one step closer to being that friend that might show up to the party. Lastly, make a commitment to yourself. Personal Accountability is more of a complimentary form of accountability. I mentioned that we typically don’t mind disappointing ourselves as much which is why simply telling ourselves we’ll show up often doesn’t produce the results we want. The idea with making it the tertiary form of accountability is less about boosting our sense of commitment to others and more about adding weight to the sincerity of our own commitment to ourselves. Since the Partner and Public forms of accountability are doing the heavy lifting of ensuring we show up, the Personal Accountability is really just piggybacking on the former two. Since the likelihood that you will follow through is high, tacking on the commitment to yourself helps make your word mean more to you when you say you’ll do something. Over time, you strengthen the weight of your own commitments to yourself. This increases your level of self-sustainability and drive such that in the future, you can simply make a commitment to yourself and have that actually mean something. Eventually, you can just say, “I’m going to do this,” and you will follow through. Update: The screen prints came in! These nice, big posters measure in at 18″ x 18″ printed French Pop-Tone Black Licorice 100C paper with Metallic Ink. Each print is signed and numbered by hand.